looking the Georges River featured Sutherland Shire's very own castle. 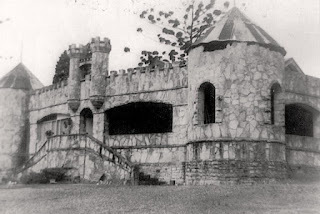 In 1942, John Mystery, one of Australia's best loved writers of children's adventure stories, purchased a five acre lot that he would spend the next decade transforming into a castle complete with turrets and flagstone paths. To enhance the atmosphere of fantasy, Mystery employed Russian-born artist George Chapoff to create mythical sculptures from rocks and cliff faces on the property. Young readers wrote to Mystery with story ideas for future books and in return were sent "lucky beans" from Jack's Beanstalk. His popularity was such that the address was simply Adventure Castle, Sydney. You can find more historical photographs of the Sutherland Shire at sutherlandshire.nsw.gov.au/history.